Charles Crodel, Munich; (sale Hauswedell & Nolte, Hamburg, 3 June 1977, no. 768); Ruth Cole Kainen (not in Lugt); gift to NGA, 1989. Art for the Nation: Gifts in Honor of the 50th Anniversary of the National Gallery of Art, National Gallery of Art, Washington, D.C., 1991, 304-305 color repro. 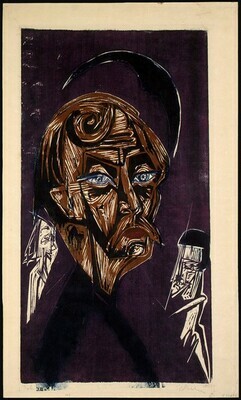 Ernst Ludwig Kirchner, 1880-1938, National Gallery of Art, Washington, D.C., 2003, no. 176. Ernst Ludwig Kirchner - farbige Druckgraphik, Brücke-Museum Berlin, Berlin, Germany, 13 Sep 2008 - 23 Nov 2008; Paul Modersohn-Becker Museum, Bremen, Germany, 7 Dec 2008 - 15 Feb 2009. NGA Kainen Coll. 1985, 18, repro. p.38. Art for the Nation: Gifts in Honor of the 50th Anniversary of the National Gallery of Art. Exh. cat. National Gallery of Art, Washington, 1991: p.304. Ernst Ludwig Kirchner, 1880-1938. Exh. cat. national Gallery of Art, Washington, D.C.; Royal Academy of Arts, London, 2003: no. 176. Gercken, Günther. Ernst Ludwig - farbige Druckgraphik. (Exh. cat. Brücke-Museum Berlin, Berlin; Paula Modersohn-Becker Museum, Bremen, 2008-2009). Berlin, 2008: no. 72.